WordPress excels at providing niche WordPress themes for different industries, a huge number of themes are now available for many different professions and the construction industry is no different. What makes WordPress so good for building small business websites is it’s ease of setup – most web hosting companies now how one-click installations and full instructions and its gentle learning curve. From first installation to writing your first page or blog post should only take less than an hour really as you get to grips with the admin interface. Another reason for WordPress being ideal for business websites is the amount of plugins and themes which tailor to this area now, it’s quite possible to build all the functionality you will need using free plugins and themes. Of course, some themes are easier to use than others which is why, if your business is dependent on your website, we recommend you purchase a premium theme as this will come with customer support ( not all free themes include support ). So you know you will be able to get help and any questions answered should you need it. In this collection, we have gathered together a comprehensive list of themes for Builders, Construction Companies and different types of tradesmen like plumbers, carpenters, interior designers, architects and cleaners. 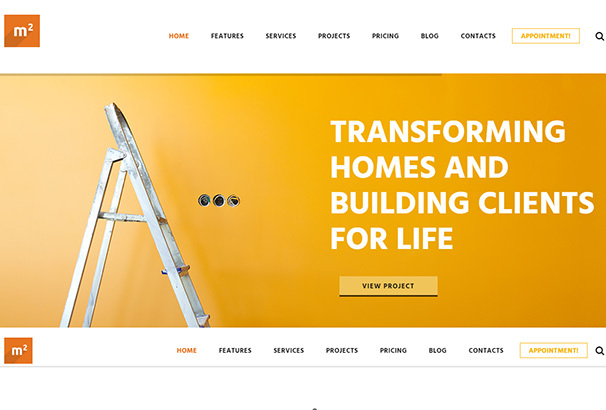 As always we only pick the very best examples so you know that if you select a theme from our list you will have a clean modern design, solid coding and well functional website you can use to promote your services within the building industry. The Divi WordPress theme makes building a smart and elegant website extremely easy. With its customizing tools, you can create a cutting edge professional looking website without having to write any code. 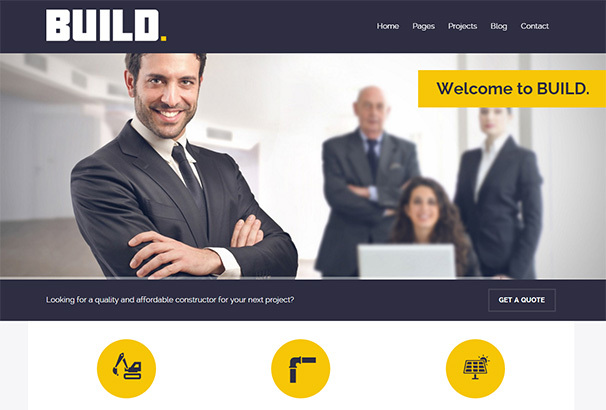 This theme is perfect for building and construction company websites. The Megalith theme is a perfect choice if you are looking for a WordPress theme with the performance and features of a professional one. Megalith has a number of built-in premium plugins such as the Visual Composer and Revolution Slider available for free! Powered by the Tesla Framework, creating a professional website with Megalith is a piece of cake thanks to its easy to use drag and drop website builder. Megalith comes with a number of elegant effects, transitions, and components that make this theme a wonderful template for construction, building, engineering and trades websites. 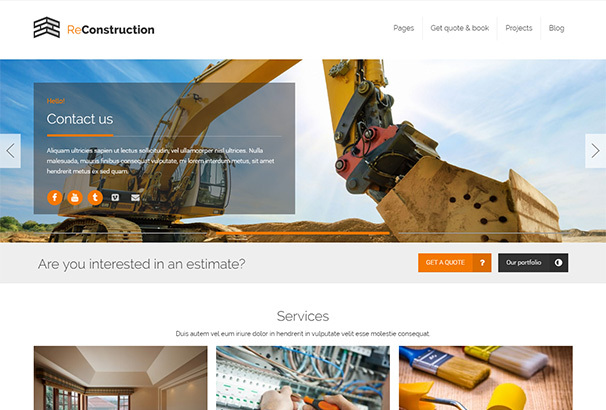 True to its name, the Construction WordPress theme is created with construction companies in mind. 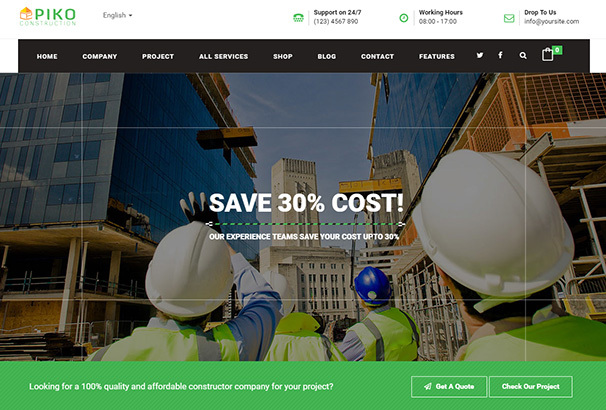 But its clean and professional appearance and carefully designed sections for services, projects, blog and contact to name a few, Construction can be a perfect theme for any freelance architect, renovation, engineering or heavy equipment website. Reach the apex of your online presence with the fully responsive Apex WordPress theme. Designed on top of the much famed Foundation Framework, Apex is all about speed and performance. With over 85% pingdom grade, Apex is designed to handle the heaviest of professional websites with ease. Just load your architecture, building, renovation or construction website on top of Apex’s professional appearance and see the magic happen. 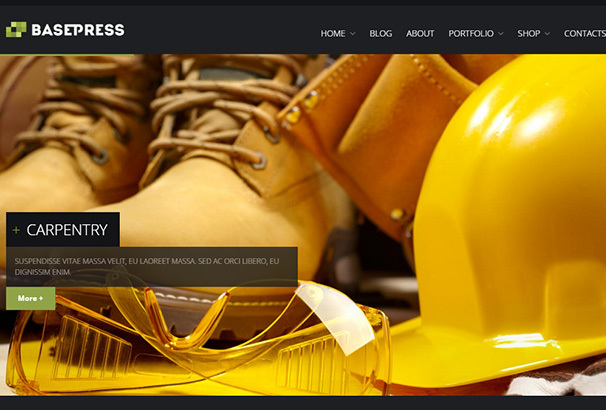 BasePress is a beautiful, clean and uncluttered WordPress theme created especially for the construction and building websites. The theme comes with the “Layer” site builder plugin which makes designing your own website a fun and easy experience. BasePress lets you choose from two different color schemes of white and dark and also lets you choose the primary color for your website. Add to that its fully responsive display and you do not need to look beyond BasePress for your professional website. 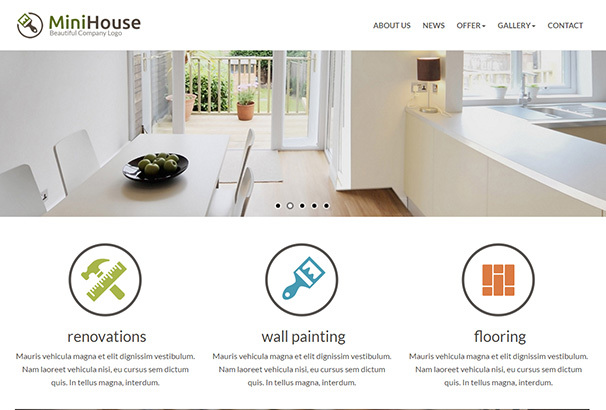 If you are looking for a WordPress theme that will let you create a simple yet attractive website in minutes, MiniHouse is the perfect tool for the trade. This fully responsive theme looks good on any device and has a simple but attractive layout that will hook your customers at the first glance. MiniHouse is perfect for construction, building and renovation companies. Create an absolutely stunning professional website with the Retina Ready fully responsive ReConstruction theme. 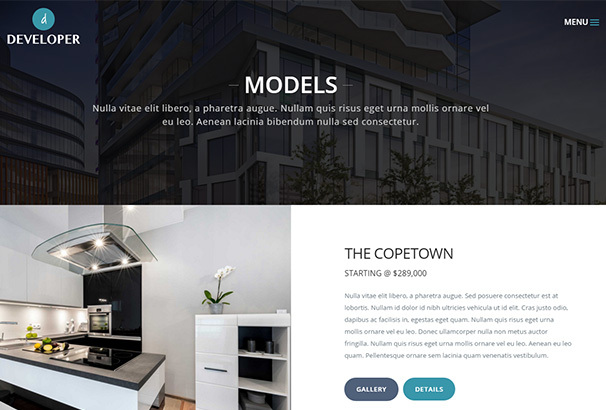 This WordPress theme is a perfect match for a variety of websites such as building, renovation, construction, painting, plumbing, engineering and even freelance architecture. ReConstruction is also very easy to customize making it a win-win. 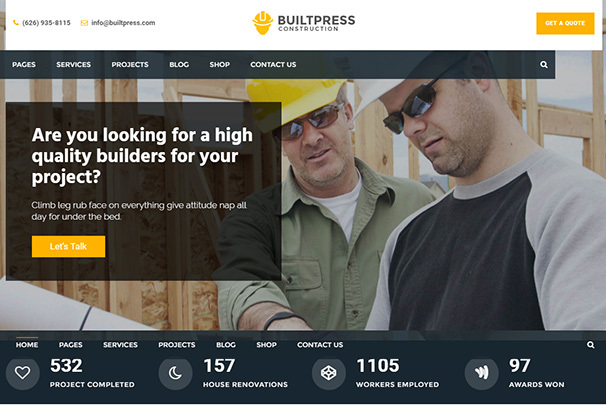 BuiltPress for WordPress is a premium theme dedicated to serious professional website building. 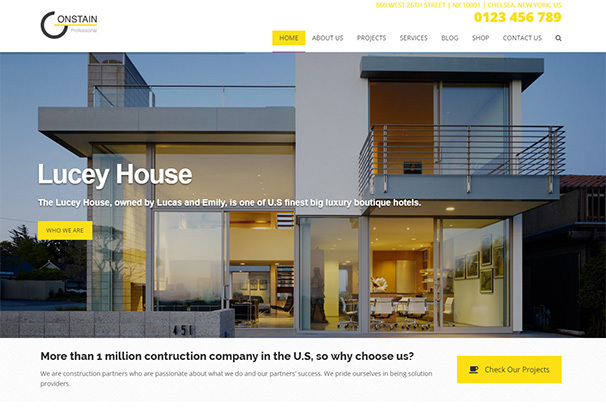 The appearance, features and design of this theme make it suitable for even the most reputed construction and building companies without having to write code to build the website. BuiltPress comes with separate sections to showcase your projects, team members, testimonials, portfolios, products and services, all neatly organized with plenty of room for content. BuiltPress provides a unique eye-catching interface to showcase the laurels and experience of your company on the front page which is a great feature to hook potential customers. BuiltPress is also fully responsive making it perfectly viewable from any device. With its highly customizable website building options, it is one of the best themes for any heating, plumbing, building, decoration, renovation or engineering website. 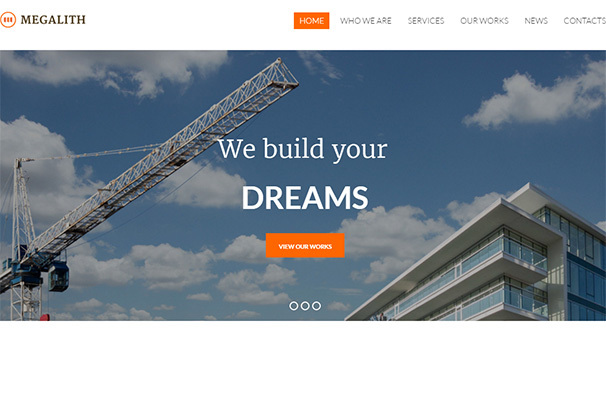 HouseBuild is a multipurpose Retina Ready WordPress theme designed to serve many different types of professional websites. The clean, uncluttered look is perfect for an architecture, builder, renovation, heating, renovation, plumbing, painting, maintenance, engineering, transportation website. In fact, whatever your business might be, HouseBuild could serve you well. 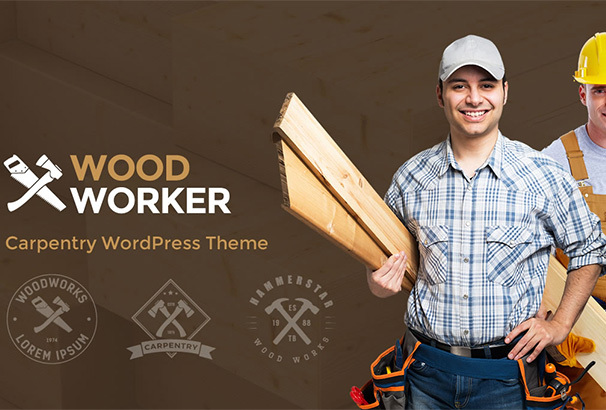 As the name might suggest, WoddWorker is a WordPress theme targeted at carpentry businesses and workshops. But this simple yet elegant theme is much more than that. WoodWorker has a clean interface but it is not bare-boned. The theme comes with separate pages for blog, services, contacts and portfolios making it perfectly suitable for a variety of carpentry, gardening, maintenance, construction, building, architecture, renovation, plumbing, welding and metal construction websites. 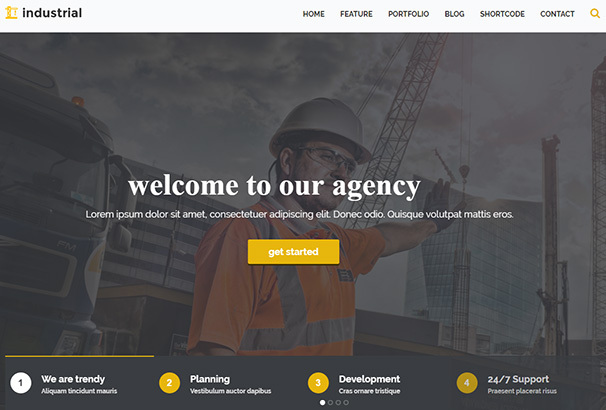 Create a smart and professional looking website for your building or construction business in just minutes with FlatBuild WordPress theme. Boasting of a unique sidebar option for website menus, FlatBuild can easily set your site apart from the rest. Constrion is a powerful WordPress theme designed to allow you to create smart professional highly customized websites. This fully responsive theme can handle any screen size with ease and still look cool. Constrion allows you to customize heavily as the code is extremely simple to tweak. 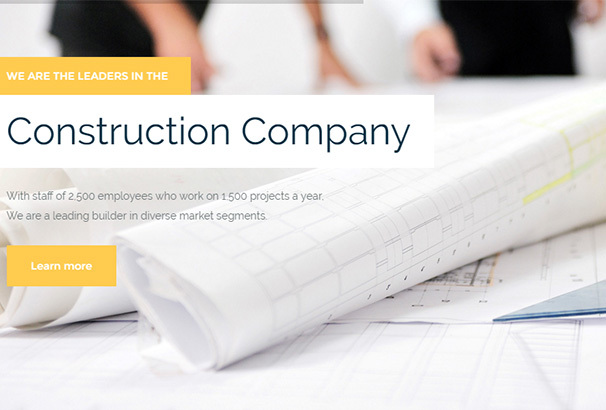 While it is mainly targeted at the building industry, Constrion can be used by any business website. The Cleaning Company theme from Ancora is the perfect fit for a facilities services company. The clean and beautiful page layout will definitely jive with the needs of any maid service, janitorial service, cleaning service and even gardening service website. The Cleaning Company theme provides you with separate sections to portray your services, your clientele, company profile and your contacts. 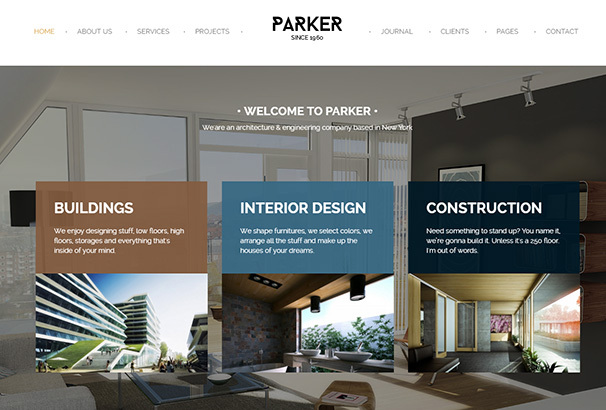 Parker is a multipurpose WordPress theme the can be used by a variety of websites to showcase portfolios, galleries or achievements. Extremely easy to customize, you can set up your WordPress website with Parker in just a few minutes. It is a perfect choice for a building company showing off their achievements and clientele, a freelance architect presenting his portfolio and even a photography website. The Batakoo WordPress theme is designed to cater to architecture, engineering, building and construction company websites. The theme comes across as extremely clean, fresh and uncluttered. The elegant and professional look could be the perfect style you needed for your online presence to thrive. Separate sections for different aspects of your business and highly customizable website building options make Batakoo the theme of choice for many business owners. Batakoo is also fully responsive so a website designed on Batakoo will look cool at any resolution on any device. 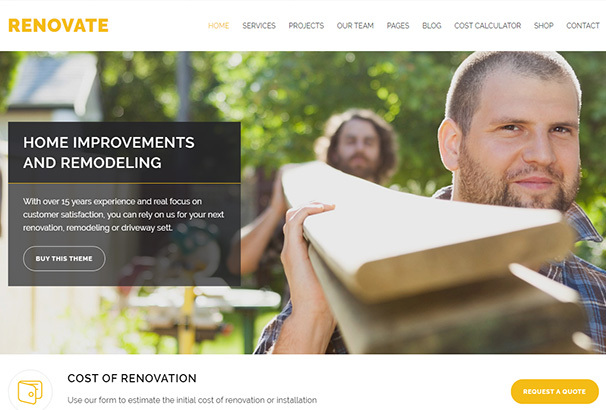 RepairMe WordPress theme is a great choice for repair or maintenance companies. This premium theme is chock full of useful plugins and customizing options. The Revolution Slider, PO Composer, Essential Grid and Visual Composer will make your job of creating a website easy and fun. RepairMe is WPML ready which means you can easily create a multilingual website and reach a larger customer base. RepairMe is also fully responsive with a one click demo installation and SEO ready to give your website that perfect support to help your business reach the top. As the name suggests, the Renovate WordPress theme is developed with the renovation, remodeling, building and construction websites in mind. It is simple, easy and comes fully responsive and Retina Ready. 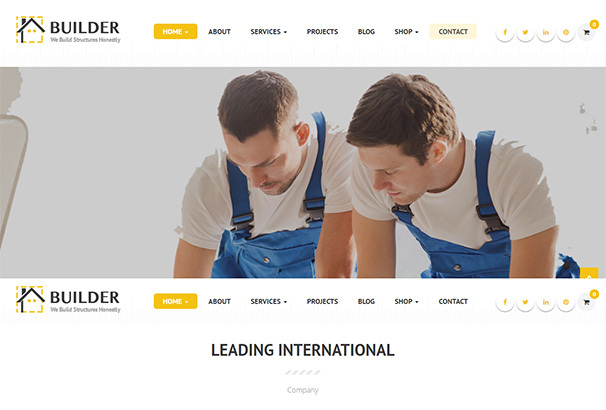 The Builder WordPress theme is designed with a simple and minimalistic look and amazing customizing options. Thanks to its easy and well-commented code, it is easy to tweak the theme to your needs. Builder is fully responsive meaning your business can reach the customers the way you want no matter what device they are using. 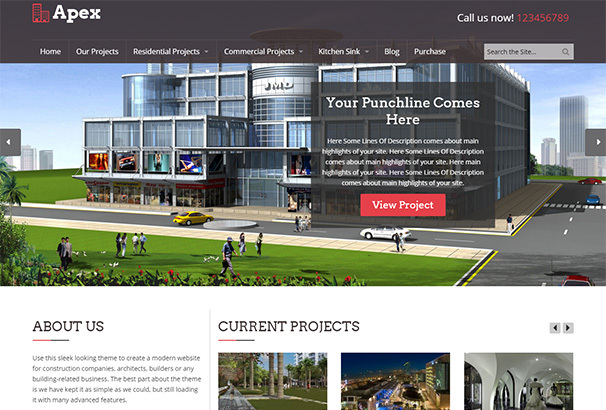 It is a perfect theme to use for building, construction and renovation websites. If you want to build a website that looks smart, clean and gets the message across without unnecessary frills, Industrial should be your WordPress theme of choice. This responsive and Retina Ready theme is designed to say a lot without saying too much. 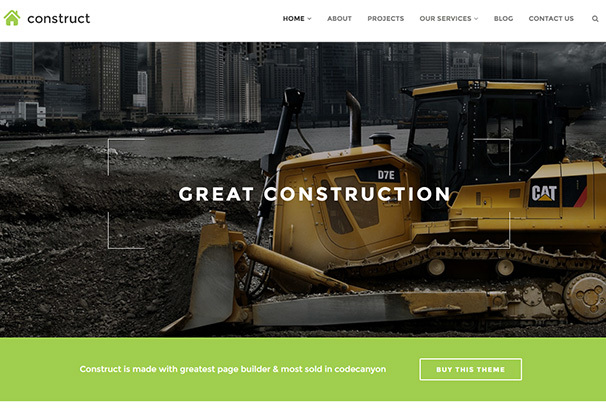 The Builder WordPress theme has been designed for construction business websites. 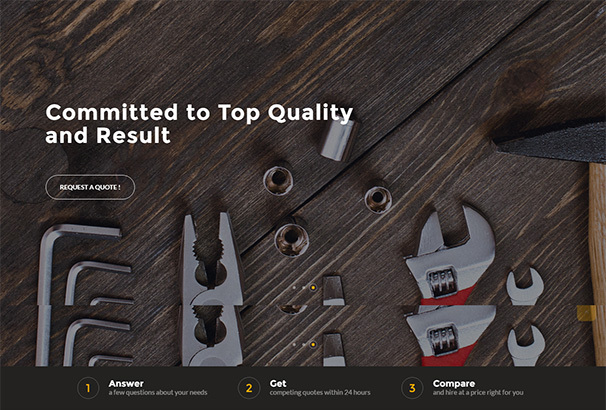 Builder will let your customers know about your services and portfolio in a no-nonsense way. Utilize the various sections to demonstrate your company’s products, services, customers and projects while a smart intuitive homepage grabs the eyeballs of potential clients. Are you having trouble creating the perfect WordPress website for your repair or renovation business? Call the “HANDYMAN”. This fully responsive theme is designed with Layers and can handle any content without breaking a sweat. 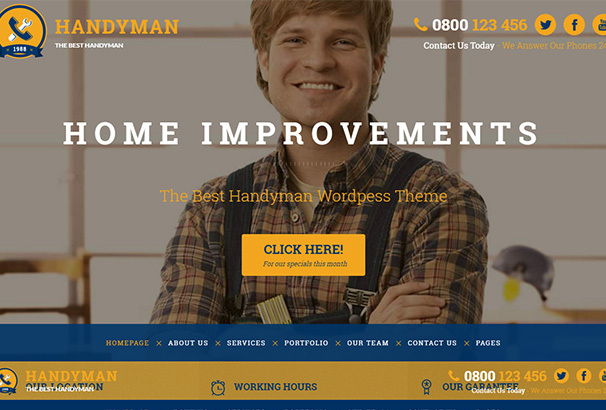 With cleverly designed sections to showcase your contact details, customer CTAs and clean yet smart navigation to various pages of your site, Handyman is here to save the day for your business. 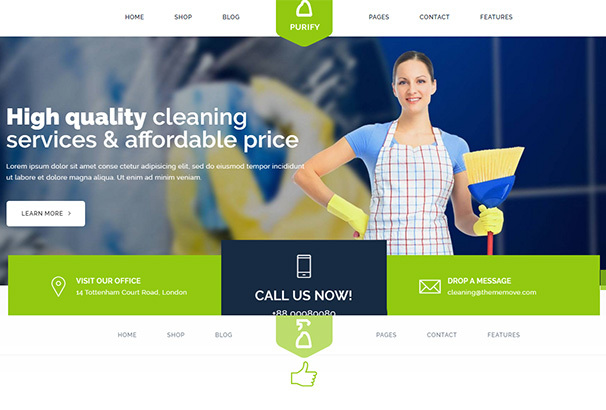 Purify is a WordPress theme designed for cleaning services companies but it is also a great choice if you have a business selling cleaning products. The clean, fresh and professional look of this theme can easily attract potential clients to your website. Simple, attractive and minimalistic, the m2 WordPress theme is a perfect suit for those renovation, construction or plumbing websites that do not want overwhelm the client with information. Get your message out in a concise yet elegant manner with the m2 theme for WordPress. The fully responsive and Retina Ready Pikocon WordPress theme is a perfect customizable theme choice for any building or construction website. Pikocon comes bundled with Visual Composer. Create the website you want with drag and drop features of the Visual Composer and stay ahead of the competition. 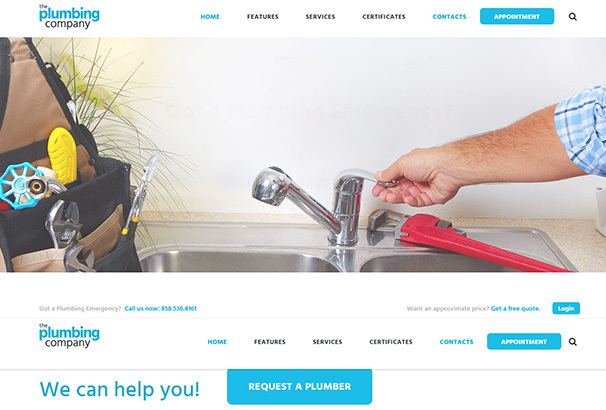 Plumbing is a fully responsive Woocommerce ready premium WordPress theme ready to be snapped up by any construction, plumbing services, renovation, facilities, gardening or business website. The power of Plumbing lies in its support for setting up an e-commerce website with great ease. The simple yet attractive design will definitely woo your customers. 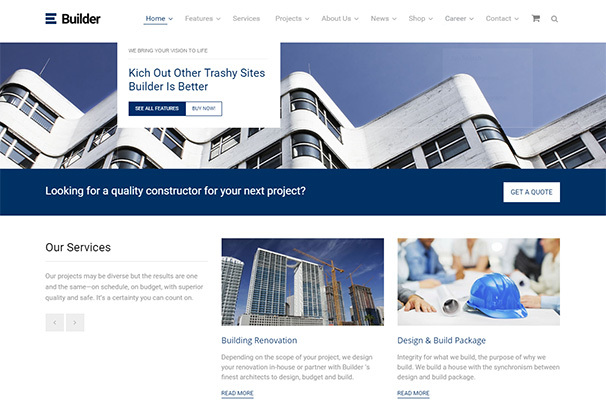 Construct a professional looking business website with Construct, the WordPress theme designed to handle construction, building, architecture and engineering business websites. 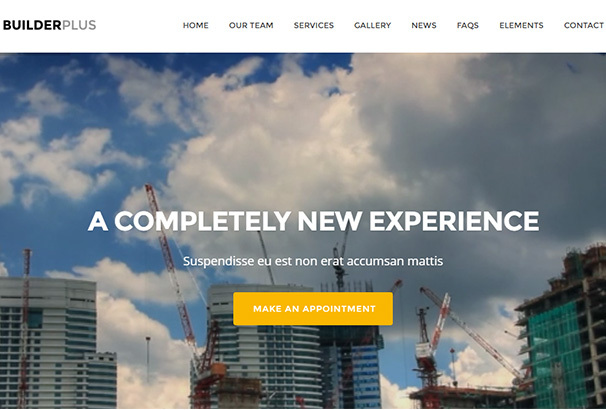 Fully Retina Ready, Construct can also be a great choice if you are developing a maintenance, renovation, facilities, cleaning, transport or corporate services website. 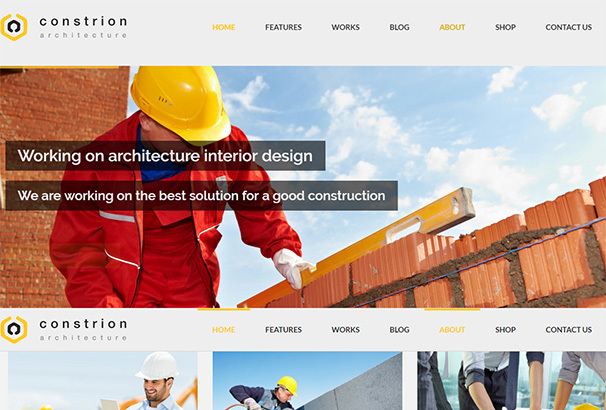 Develop a perfect construction, building or architecture services website with Developer, a clean and cool WordPress theme. With elegantly designed pages and a large header image to showcase your services or laurels, Developers is a fast and easy choice. Builder is a great solution for your website building worries as it comes with built-in Visual Composer and Revolution Slider premium plugins. This premium WordPress theme is all about options and quality. The Visual Composer lets you drag and drop to create your website while you can choose between two different homepage layouts to suit your need. Add to that the separate sections for your services, projects, products and contact, and this is a match made in heaven for a building or construction website. The Urban Builder WordPress theme takes a different approach towards presenting your business online. Instead of going down the same old route of jotting down page after page of services and projects, why not take advantage of Urban Builder’s unique gallery layouts? Available in grid, classic, masonry and polaroid to name a few, the gallery format will give an edge to your construction, building, renovation, painting or plumbing services website. Are you into creative construction and building services? Then you will just love Melville. This Retina Ready fully responsive WordPress theme is elegance and class packaged in the most attractive way possible. 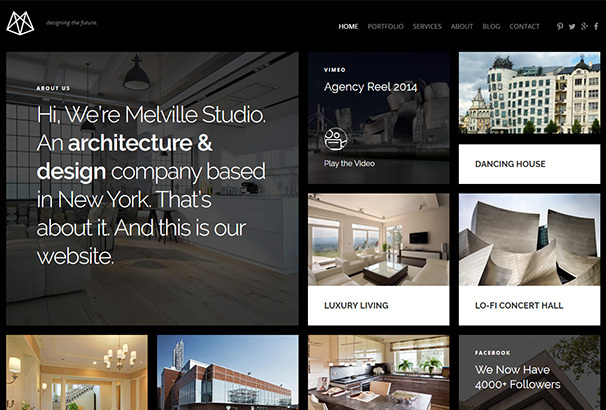 Your building, construction, remodeling or interior designing website built with Melville is sure to turn heads. 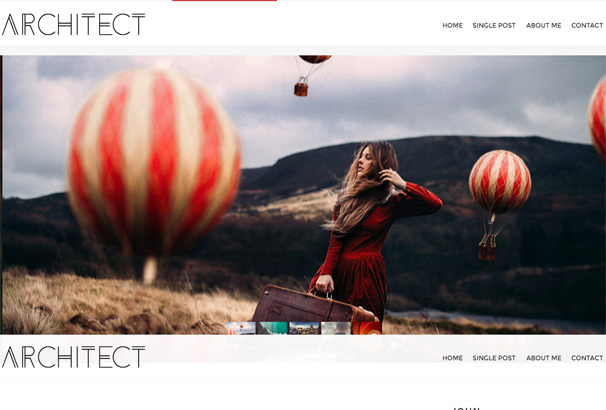 It is also a great theme for photography websites. 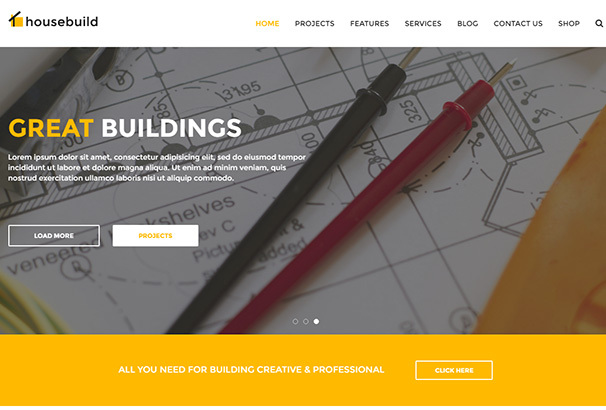 Builder Plus is the perfect premium WordPress theme if you want to build a modern, fast and attractive website with ease. The theme comes bundled with page builder, theme customizing options and a one-click demo installation. Use the page builder to design your builder, construction, engineering or gardening services website within hours. 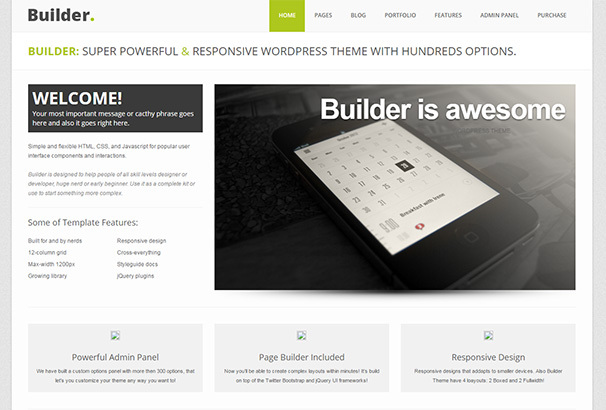 Due to the latest PHP technology used, the Builder Plus theme requires PHP version 5.4 and higher. 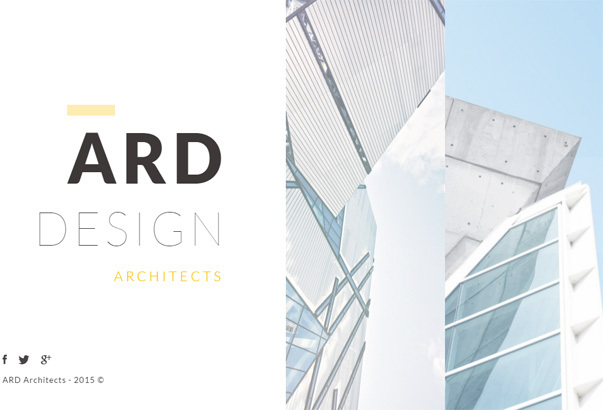 Show off your architectural achievements with the clean, minimalistic and elegant ARD WordPress theme. ARD comes with built-in Visual Composer which lets you create and customize a website very easily. 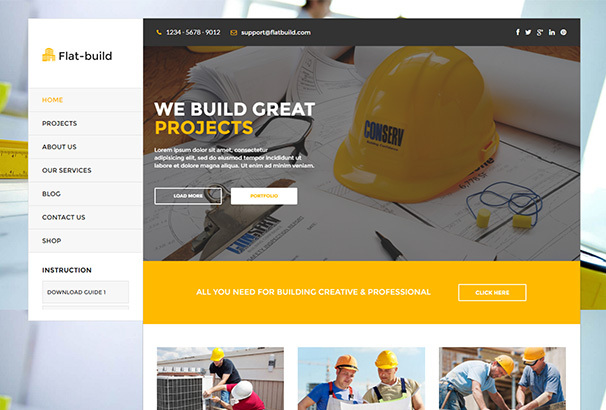 A great choice for heavy duty construction, engineering and builder company websites, Constain comes bundled with many goodies, the Woocommerce support, Visual Composer, Revolution Silder and an advanced admin panel. With Constain you can drag and drop to create a website easily, start an ecommerce website and beautifully flaunt your projects with the silder. 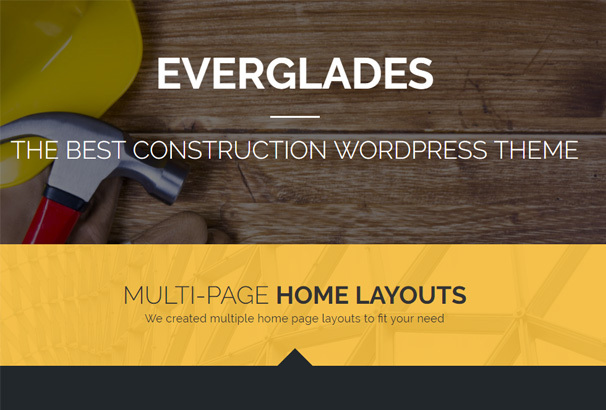 Another winner in the building and construction WordPress themes segment, Everglades will spoil you for choices when creating your professional website. It comes with Visual Composer which makes website building extremely easy. Support for over 600 Google fonts, Revolution Slider, content slider and multiple header layouts let you create just the website you always wanted. 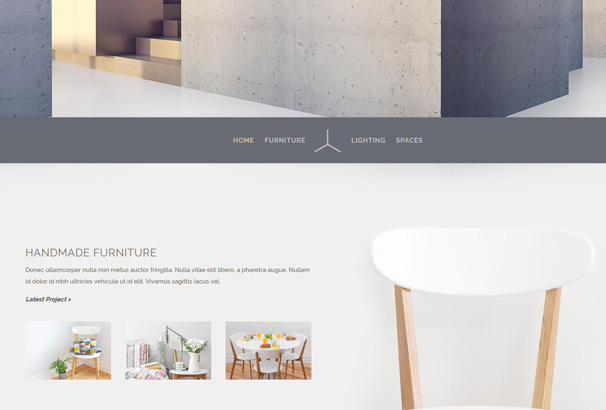 Simple, minimalistic and yet attractive, the BUILD WordPress theme is not into frills but lets you create a professional looking business website in no time. 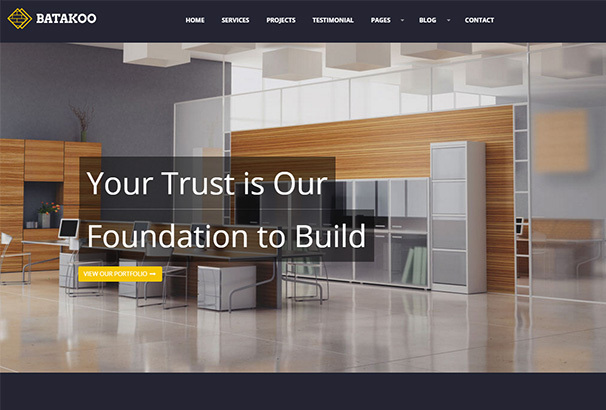 Take advantage of this fully responsive theme to BUILD your engineering, construction, building, plumbing, painting, facilities, gardening, renovation or interior designing website. The Architect WordPress theme is the perfect choice for any personal or business portfolio website. With the built-in Revolution Slider, tons of customizing options and fully responsive design, Architect definitely packs a punch while keeping a clean, fresh and minimalistic look. Use it for your freelance architect portfolio, blog, building, construction or an interior desgining website and be amazed by the result. 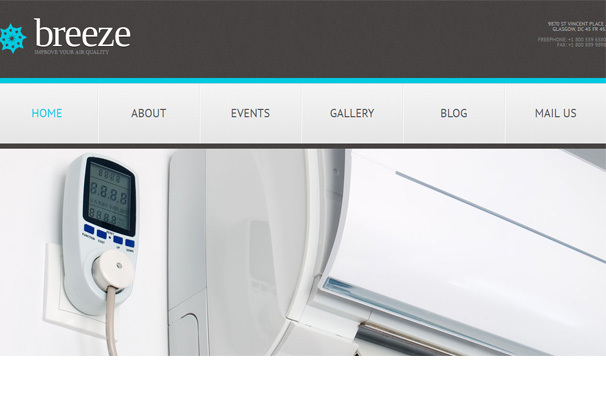 The WordPress theme Breeze is a fully responsive solution for your air conditioning website. But a quick look at the layout will tell that it is perfectly usable for a plethora of businesses including cleaning, maintenance, interior decoration and gardening services. 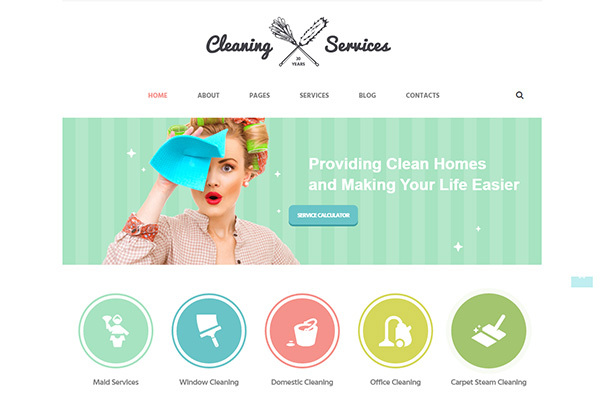 Cleaner is a fully responsive and customizable WordPress theme developed for cleaning services websites. It is also WPML Ready making it perfect for companies with a multilingual customer base. 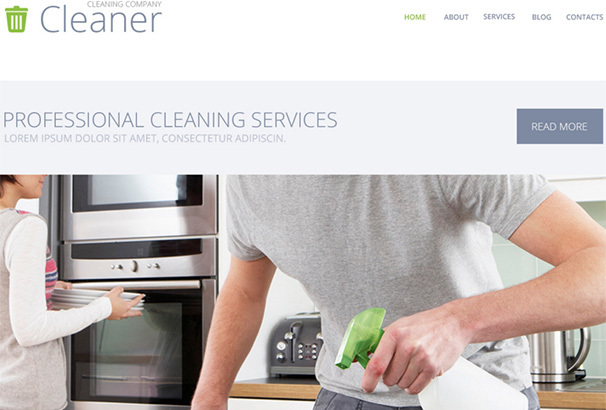 Use Cleaner for your cleaning services, maintenance services, gardening services or facilities management website. 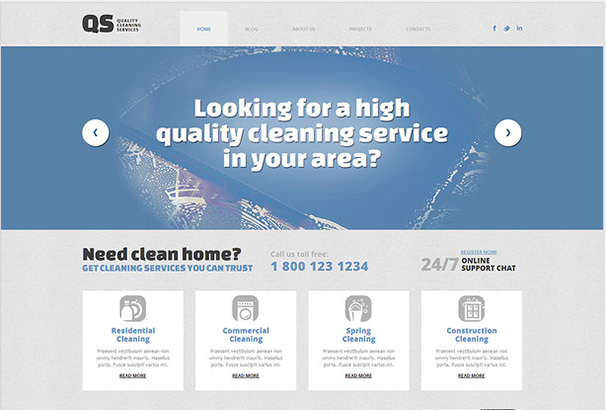 As the name suggests, Quality Cleaning Services is a fully responsive WordPress theme especially targeted at cleaning services websites. It being SEO ready means you can gain that elusive online presence in search results with ease. The clean and professional looking layout with the built-in slider is perfect for a number of business websites. 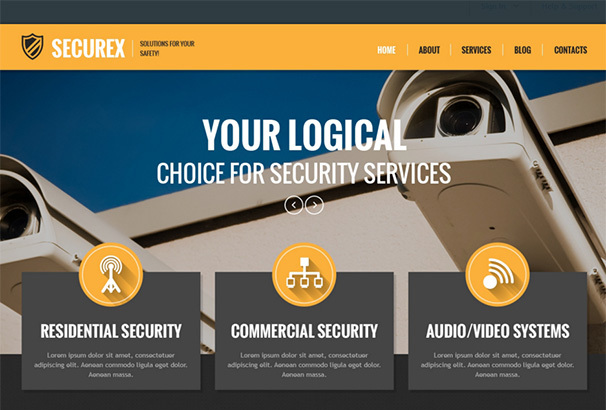 Securex WordPress theme is perhaps one of its kind as it specializes in websites providing locksmith services. The website has a smart professional look so you can use it even if you are providing commercial services to large organizations. The smart layout and eye-catching color scheme can also work for many different types of websites. 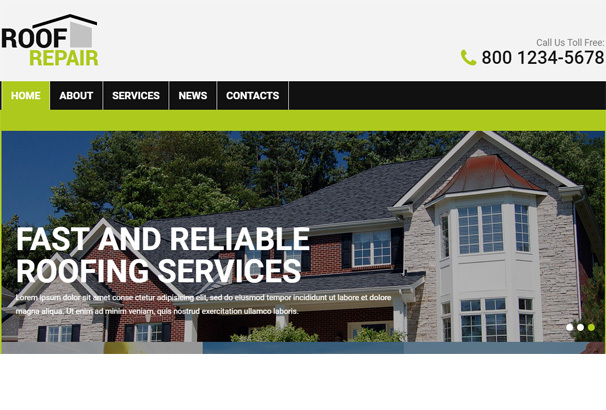 Dedicated to professional roofing service websites, Roof Repair can be your WordPress theme of choice if you are looking for a simple, smart and attractive way to reach your clients online.